Commemorative Monuments are made out of a linear low density polystyrene that is UV stable, weather resistant and in non-fading colors. Our Commemorative Monuments are made out of a linear low density polystyrene that is UV stable, weather resistant and in non-fading colors. 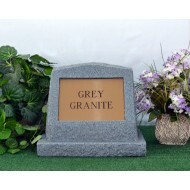 We currently have them in 8 different colors, with the appearance of cut stone, weighing seven pounds empty. These monuments are 12 1/2 inches high, 15 inches wide, and 9 1/2 inches deep. There is a recessed area on the front which measures 6 1/2 inches high by 9 1/2 inches wide. This recessed area is for the installation of a plaque of your choosing. A 2 inch plug is located in a recessed area on the bottom, which allows the monument to be filled with sand or for the placement of your loved ones ashes. The monument, when filled with sand weighs about 45 pounds. Each monument can handle 625 cubic inches of remains. 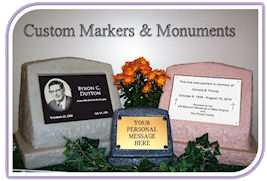 Commemorative Monuments are sold without the Plaque insert. 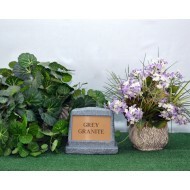 You should order the plaque at the same time so that we may prepare the finished product prior to shipment.